1. 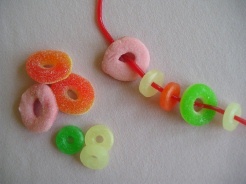 String your favorite circle candy onto the shoe string licorice and tie the ends together. Another option besides the shoe string licorice is bubble tape, which is at most check stands. You may have to fold it over, but you should be able to string some candy with it.